Video streaming websites are increasing getting popular these days but the problem is sometimes you need to download video on your hard drive, may be for some project or just to watch it offline. Well there are a lot of free video downloader’s you can use. But I have found a trick which will help you save any video from any video streaming site without the hassle of installing a software plugin or other stuff. Many people have slow internet connection or limited data plans this trick will help you save a lot of bandwidth too. All you have to do is just watch the video normally and minimize your firefox browser and follow the instructions. It’s simple. Before you read further, you need some stuff to be checked and done. 2) I have tried it on Windows XP and Windows 7 so you should have either of the two or Win.Vista will do. 3) You need to change a small setting i.e. Your Hidden files and folders should be visible. Let the video buffer completely just like you normally watch. Once it’s loaded minimize the Firefox browser. Go to; Computer > Organize (Left side Top tab) > Folder and search options > View > Show hidden files, folders and drives > Apply > Ok. You can change it back to normal once you are done saving the video in the same way by selecting Don’t show hidden files, folders or drives. Go to; My Computer > Tools Folder options > View >Show hidden files and folders Apply Ok.
Once you have entered the folder, change the folder view to detail (Right click detail). 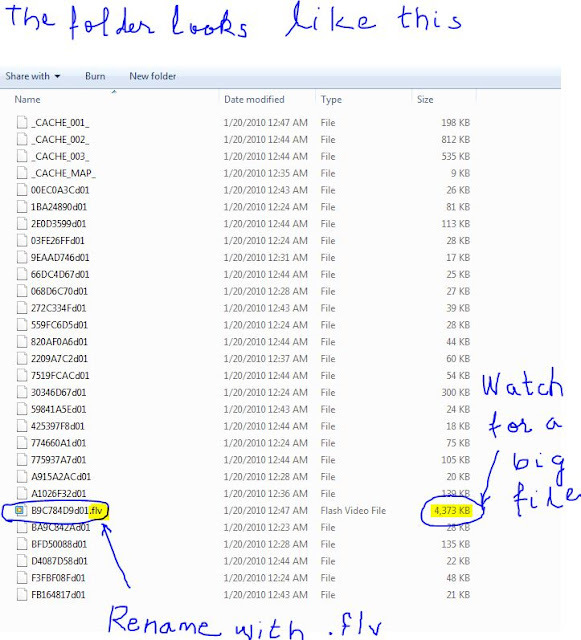 Now you will see a list of file with random names, watch out for a bigger sized file (ignore the initial _CACHE_ files). Rename the file with a .flv extention. And play the file with any video player which supports flash video, VLC is the best . If you see the video playing on the player you are successful. Its trial & error if your not successful try out other larger sized files. Its simple! You might find it kind of painstaking at first but once you do it a couple of times you will find it very easy. Trust me. I always use this trick and i guess its exclusive on Tech Center, hope you like it.